Cork was referred to as "Culinary Cork" in the guide book but to be honest I haven't found Irish food to be that interesting. It's not bad, I just haven't found that much out of the ordinary. It could be that there is just so much Irish influence in the US that shepherd's pie and fish and chips are pretty much the norm. Speaking of influence, so far ours seems to add up to fast food pizza and hot wings. I'd say that's a pretty good summary of American food. The one thing we wanted to see in Cork before hitting the road was a bust. We got to the English Market after it was supposed to be open but the workers must've been moving slow after a big holiday party or something because most of the stalls weren't open. Lame! I thought these Christmas cakes were interesting because half of them said Happy Christmas and the other half Merry Christmas. The couple of little mince pies I ate for breakfast were something different. Their taste was at the crossroads of sweet and savory. The market being closed was a little disappointing but I quickly forgot about it when we made it to our next destination: Blarney Castle, home of the famous Blarney Stone! It is said that whoever kisses the stone will be given the gift of gab. It is also said that you will have also exchanged saliva with thousands of dirty tourist mouths. This might be the first time I've seen a "No Drones" sign. The future is now. I'll just use the frame from my college degree. Inside the castle is a very small, winding staircase that took some effort to scale to the top of the castle where the stone is situated. Somehow I got tricked into going first. So you sit down and lean backwards in order to kiss the stone, and a fast talking handler guy grabs you and dangles you over the edge of a castle. What could go wrong. There are guard rails so I don't think you're in any actual danger but it was still kind of scary. There was another guy up there taking pictures, which could then be bought down at the gift shop. These guys must be raking in the cash. The faces we were all making were pretty amusing. Sort of like the face of a baby who's just been born: all red and scrunched up and upside down. I am obsessed with old airline posters. They look so cool. We popped over to a nearby little port town called Kinsale and had some lunch. This time my hot whiskey had some cloves stuck in the lemon wedge. So fancy. I had all the mussels in the ocean. I was impressed with how American the crap in some of the shops felt. 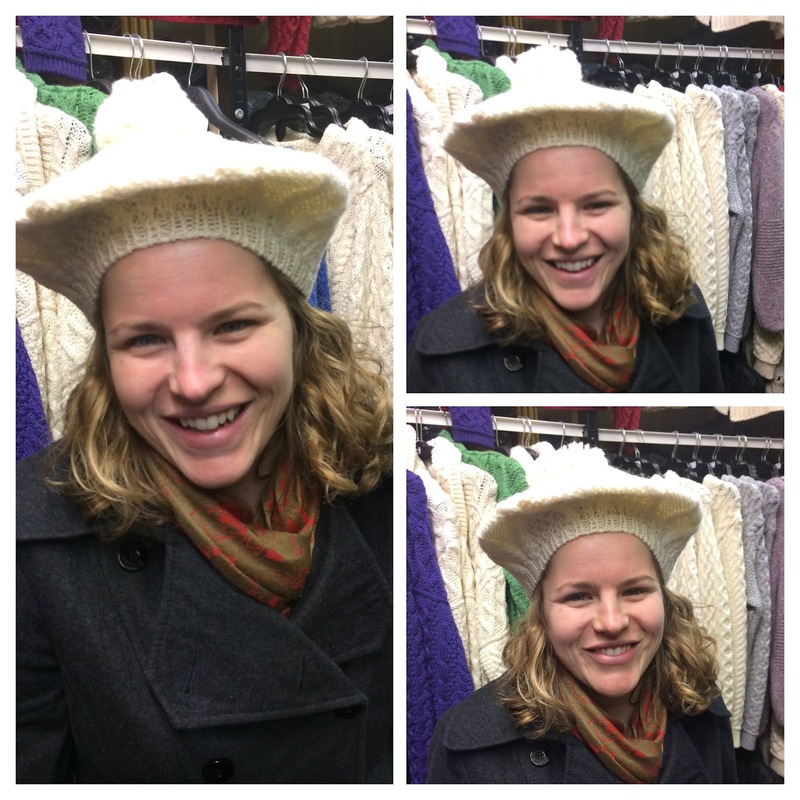 I'm sad that I couldn't convince Lydia to buy this hat. This particular shop owner was really funny, and he had this collection of police patches. Sure enough he had been to St. Louis County and had a patch to show for it. No one would buy me this statue of a leprechaun riding a pig. Maybe next Christmas. We hit the road, but stopped in another little town called Adare in County Limerick along the way. Garda is what the police are called in Ireland. "Craic" pronounced like "crack" is the Irish word for fun. If you want to be slangy you can say something like "what's the craic?" in place of "what's up?" Ireland's roads can be pretty nerve wracking. I turned the radio on for some distraction and at one point a guy was speaking Gaelic at length, so I taped a bit of it for giggles. As usual we kept our lodgings fresh. This time we stayed at a pub call McGann's in Doolin. We pretty much drove from one end of the country to the other with our Cork to Doolin itinerary. We had a nice meal then watched a bit of the live music. Doolin is a big traditional music center in Ireland so we couldn't go wrong. It was interesting, this particular band didn't have words to their songs, and the songs sort of meandered on for a while to the extent that it was unclear if it was a complete song or if they were just sort of jamming. Anyway, it was nice.